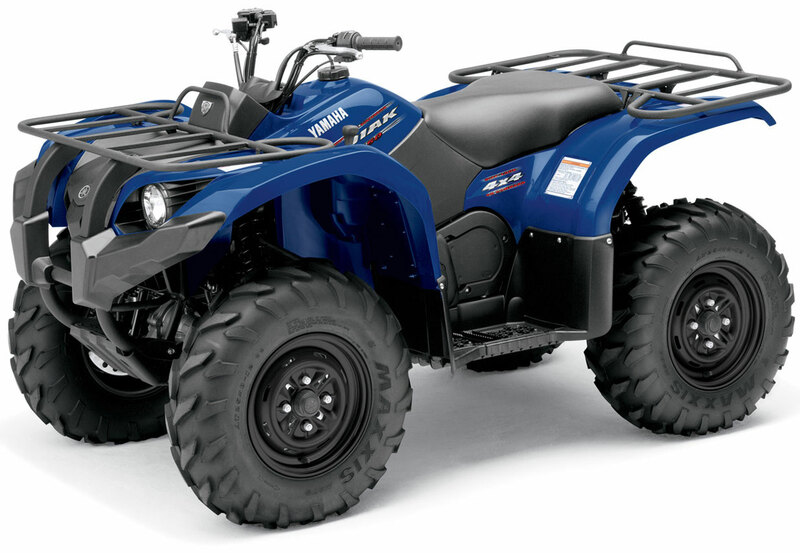 The 2010 Yamaha Kodiak 450 is Yamaha’s fully loaded mid-size ATV featuring On-Command 4WD with a front differential lock, the super smooth and reliable Ultramatic transmission, and the superior ride comfort of independent rear suspension (IRS). Following closely in the Grizzly footsteps, you’ll find our Kodiak’s. Built as every bit as tough as their big brothers, these affordable mid-sized ATVs are chock full of Yamaha exclusives and real-world tested features. 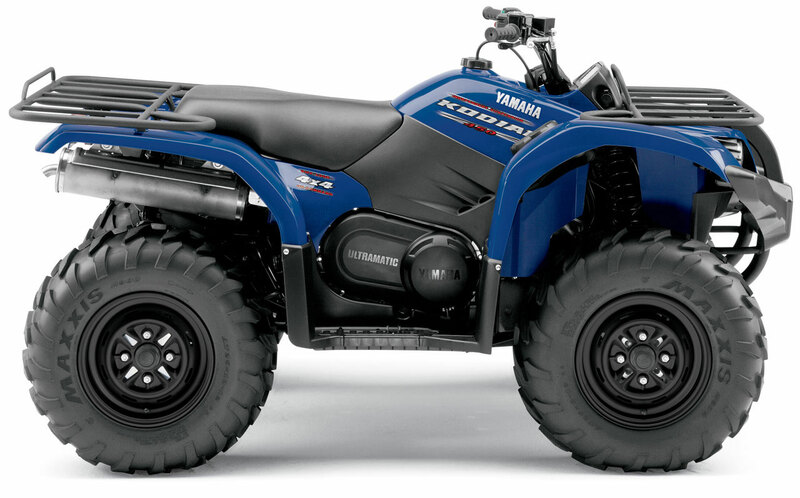 Yamaha’s bullet-proof Ultramatic® transmission – featuring both high and low range – serves up 4-wheel engine braking so you can conquer any terrain. At the push of a button you can select between 2WD, 4WD and Diff Lock 4WD, using Yamaha’s exclusive On-Command system, yep it’s standard equipment. All Kodiak’s have a preload-adjustable, long-travel suspension, 10.8 inches of ground clearance and high-traction tires. It all adds up to one nimble ATV with a smooth ride. Power is nothing if it comes with a bunch of additional weight. Considering the kodiak 450 is lighter than many of the competitors in this class and this bear’s power to weight ratio offers some hefty advantages over some of the bigger and bulkier ATVs. Less weight has an effect on everything from handling and acceleration to hill climbing and mud prowess. Fully automatic transmission with engine brake and automotive style transmission lock parking mechanism. Push-button servo-controlled “On-Command” system allows you to switch between 2WD, limited-slip 4WD and fully locked differential 4WD – all with the simple push of a dash mounted button. Real 4-wheel drive when you need it. With Diff-lock engaged, there’s no need to wait for one wheel to spin. You have traction to all 4 wheels, immediately. This puts you in total control… you decide when you need 4 wheel drive… the machine doesn’t decide for you. These Maxxis tires offer excellent traction over a wide variety of terrain, including mud, rock, sand, and hard packed trail, without compromising ride comfort. High-capacity cooling system with high-mounted fan-cooled radiator for consistent engine performance, excellent durability and protection from sticks and rocks. IRS independent rear suspension, sway bar controlled. Sway bar added for limited chassis roll and great terrainability. Differential lock speed override switch (forward only) allows owner to override the speed limiter for certain conditions. Electric starting with recoil backup (electric starter will work in any gear). Computer-designed steel tube frame and rubber-mounted engine for a rugged, durable design and reduced vibration. Digital information centre LCD display for speed, odometer and on-Command functions, as well as LED warning lamps. 12-volt D.C. terminal provides a convenient power source for such accessories as cellular phones, handheld lights or GPS. Rear “wet” brake uses friction plates immersed in an oil bath and is sealed to keep out water and debris. This provides consistent braking performance, regardless of riding conditions. Internal engine counterbalancer minimizes engine vibration to rider. Spin-on oil filter simplifies oil changes. High-positioned carb air intake and clutch intake and exhaust vents prevent water from entering carb or V-belt cover. 4WD front differential lock. Positive mechanical lock-up for maximum traction in 4WD. New forward speed override switch. 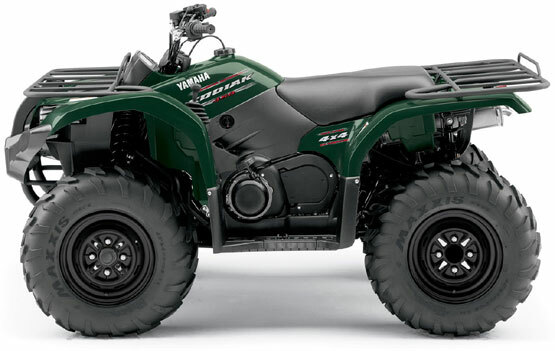 Wide Grizzly type front fenders and new bumber design with excellent mud and splash protection. Dual 30-watt sealed headlights with replaceable bulbs provides excellent lighting, prevents water penetration and simplifies maintenance and reduces cost. 25-inch Maxxis tires with all-new, more aggressive tire tread pattern for great traction and excellent durability. Sealed marine-style electrical connectors prevents water from entering electrical components and wiring.